I love the details on this dress. 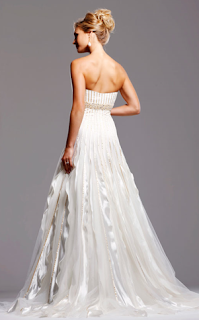 Its called Gwenyth from David Tutera by Faviana. The dress has a little bit of sparkle without looking bedazzled. Also the bottom of the skirt reminds me of feathers (peacock) without looking like a giant feathered cupcake.